Here’s how to make a homemade Advent wreath, for a candle-lit countdown to Christmas. Advent marks the four weeks leading up to the celebration of Christmas. It can be such a busy time for families, with lots of shopping and events taking place. 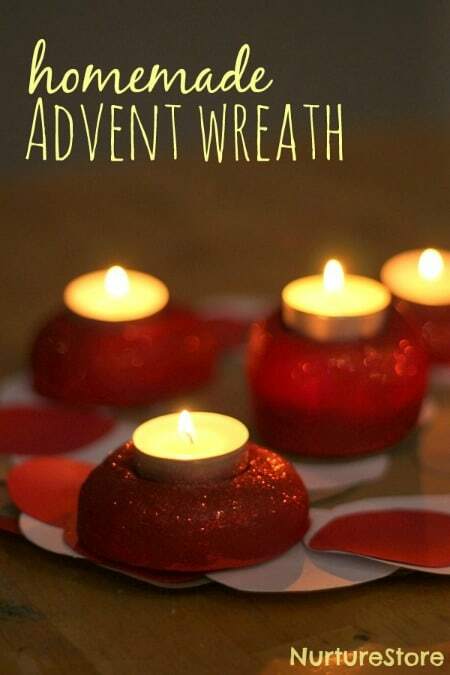 I think the tradition of an Advent wreath is a lovely way to catch your breath and take a pause in all the busyness. There are five candles on an Advent ring, and the tradition is to light each one in turn on the Sundays that run up to Christmas, lighting the central fifth one on Christmas Eve or Christmas Day itself. The lighting of the candles can be a time to gather the family round and to have a homemade ceremony of some kind. You might pray, share a Bible reading or sing a carol. 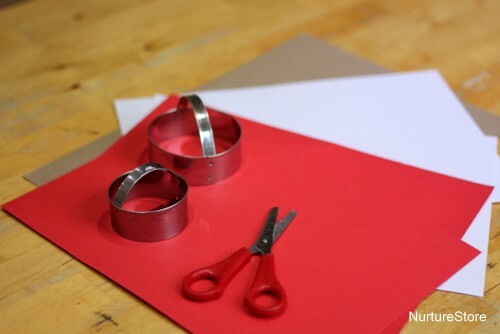 You might have a quiet dinner together, or sit and craft awhile, making some homemade gifts. You might simply snuggle up together, under a warm blanket, and read a Christmas story book. 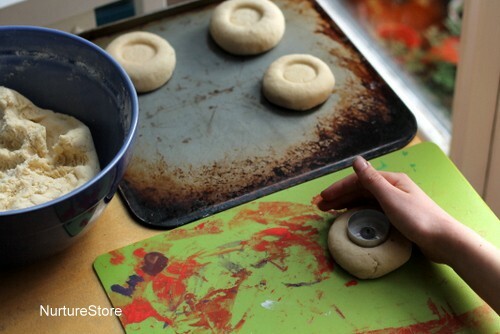 Then you can mould the dough into any shape you like ~ the dough makes great Christmas tree decorations. 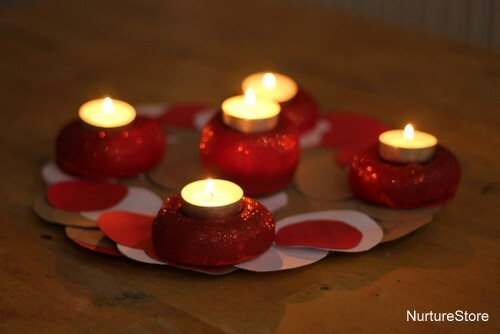 To make these candle holders, my daughter formed the dough into small rounds, and used a tea light holder to push the right candle-sized shape in the top. She made the candle holder for the centre taller than the others. Then you need to place the candle holders on a baking tray and bake at Gas 1/2, 120C, 250F for about 3 hours. Exactly how long it take to bake will depend on how big you make your candle holders. The idea is to dry them out, so you might want to turn them over half-way through to allow them to bake underneath too. 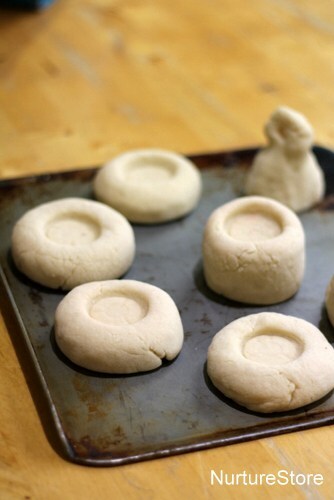 While you’re waiting for the candle holders to bake, you can make the Advent wreath. We took red, white and brown card and cut out lots and lots of circles. We used a large and small cookie cutter to draw round, to get our circles. 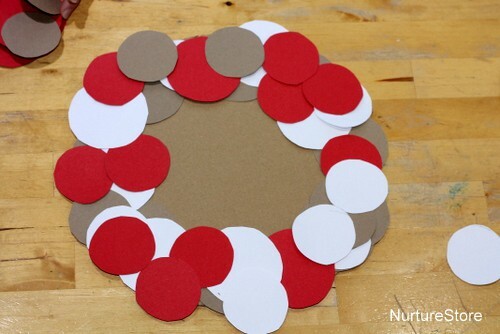 Then we glues our circles down on a piece of thick card, to give us a decorative base for our Advent wreath. 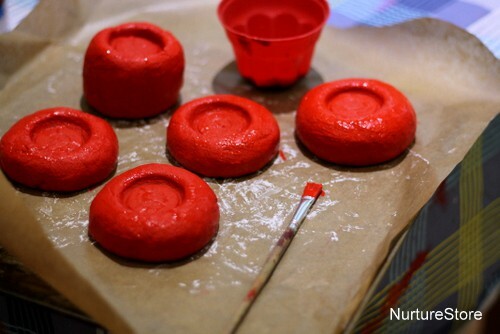 Once the salt dough candle holders are baked, and you’ve given them time to cool, you can paint them. We used red acrylic paint, and sprinkled on a dusting of red glitter while the paint was still wet. You can add a layer of protective varnish, but we just used two coats of paint. Then you’re ready to assemble your Advent wreath, placing four candles around the Advent ring, with the final one in the centre. Advent begins on Sunday 1st December this year, when we’ll light our first candle at dinner. We’re gathering a basket of Christmas stories and plan to read one each day, so we’ll read the first by candle-light.